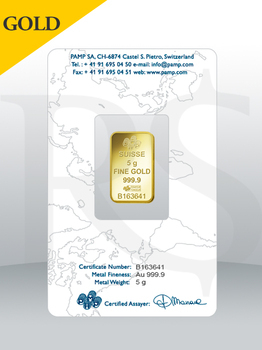 PAMP Suisse Rosa 5 gram 999.9 Gold Bar (With Assay Certificate). 5 gram .9999+ Fine PAMP Rosa Gold Bars contain 5 gram of Gold. Each is individually serial numbered and comes with the original assay card. Each bar is hallmarked with its purity, weight, serial number as well as with the world famous PAMP Suisse logo, and features the beautiful and graceful Rosa design against a proof-like finish. 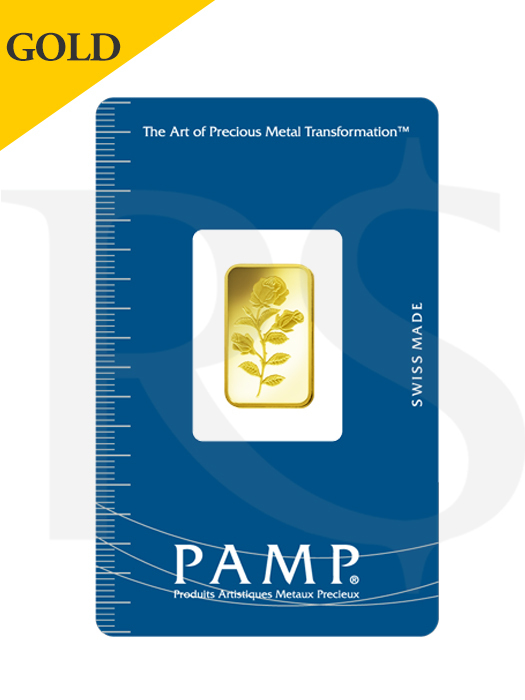 All PAMP Suisse Rosa 5 gram Gold Bars ship with their respective assay cards and measures 22.1mm x 13.1mm with thickness of 0.90mm. You can check out more of our PAMP 999 Fine Gold Bar here.